Following last night’s thriller, which featured career save No. 600 for Trevor Hoffman, we had a sidebar on his Brewers teammates’ reactions to the moment. While that story captured the emotions and feelings in the clubhouse, there was far too much to fit in after the game. With a guy like Hoffman who’s frequently described as the “best teammate,” there was hardly of lack of things to say in the home clubhouse. According to left fielder Ryan Braun, the emotion following the final out of the game was far greater than the meaningless early September game that it starter out as. Perhaps most excited about the achievement — more so even than Hoffman himself — were Hoffman’s bullpen mates. Reliever Todd Coffey described his feelings as “beyond goosebumps” as he become more of a spectator than a teammate. After that, he went on for a few minutes about the emotions he felt both when Hoffman entered the game and recorded his 600th save. “As soon as he walked out of the bullpen, the entire bullpen was up and I think we were all clapping louder than the fans, we were hollering louder than the fans,” Coffey said. “I don’t think any of us actually realized we were in the bullpen. We were all out there with Hoffy. Others had less to say, but their thoughts were no less insightful. Veteran left-handed starter Doug Davis recalled being part of a similar moment early in his career. Another Brewers starter, right-hander Dave Bush, took particular notice of the number of people in the dugout during that final inning, as everyone wanted the best view they could get of Hoffman’s historic save. “It’s an amazing number, one that nobody’s ever gotten to before,” Bush said. “I can’t even fathom at all what it takes to reach that. After beginning the season at Double-A Huntsville, catcher Jonathan Lucroy called the game Tuesday night, including Hoffman’s thrilling ninth. As he waited on the mound for the all-time saves leader, with “Hell’s Bells” blaring from the stadium speakers, Lucroy said he had goosebumps and began to shake from the nerves. He stayed relaxed behind the plate, though, and didn’t change a thing. Until the final out as he ran down toward first base. “It’s something that I’ll remember for the rest of my life and cherish,” Lucroy said. “To be able to remember something like that, it’s a blessing for me to even be able to experience it. “To see him achieve a goal like that is just something that every baseball player lives for. It couldn’t have happened to a better guy. He totally deserves it. It’s an honor for me to even be here and just experience it. “I was jacked up and excited. I told myself I was going to sacrifice my life to get an out for him if I needed to. I was going to go everything I could to get an out, no matter what I had to do, I was going to sacrifice everything for him. “For somebody like that, to put in the kind of work he has, to play for as long as he has, and have the kind of character that he has, and for something like that to happen to him, and for me to even be there and be a part of it, it’s an unbelievable feeling. “I was the first one [to the mound]. Usually I run down to first base and back up on ground balls, but I cut it off halfway. I was going to go get there first as fast as I could. I grabbed him and he grabbed me in a headlock and then everybody else hit and we went at it. “It’s not very often you see grown men crying out there and there were grown men crying on the field. It was very emotional, I was trying to hold back as best I could. It’s just the payoff for so much hard work and just shows you that if you work hard and be a good person in this game there’s a lot of good things that happen to you. Of course, no story about Hoffman’s historic accomplishment would be complete without some mention of his replacement, rookie John Axford. As has been the case all season, Axford had nothing but positive things to say about his mentor in the Brewers bullpen. “He’s meant everything to my development because he carries about his business perfectly. He does everything right,” Axford said. “That’s been the best mentor for me. I just try to watch him and see what he does and see how I can build upon that. Every time I go out there I just try and do right by Trevor. I just want to do basically what Trevor would do and do things the right way. Third baseman Casey McGehee admitted he was nervous when Hoffman entered the game. In fact, he was just hoping the ball wasn’t hit to him. Once the final out had been recorded, however, McGehee was thrilled to be a part of such a big moment and to have played with someone who is the all-time leader in any category. “I think the reaction of all the guys kind of let everybody see how important to this team and to us he is,” McGehee said. “You couldn’t have asked for it to happen to a better guy. He’s the ultimate professional with everything he does. “There’s not too many people you played with that you can say you played with the all-time best anything. When my career is over and I’m sitting around telling stories at a bar somewhere, that’s going to be one of the ones I tell. “You can’t block that out, we all knew what was going on. Most of us, we’re huge fans of the game. Coming up, we remember watching Trevor Hoffman when he was in his prime and he was virtually unhittable. To be any small part of it, it’s pretty special. The final out was recorded by Prince Fielder, as veteran shortstop Craig Counsell fielded a ground ball and fired to Fielder at first. As Fielder closed his first-baseman’s mitt on the ball, he joined McGehee and Lucroy as the first three players to embrace Hoffman on the mound. “It was awesome,” Fielder said. “Coming into this year, you knew he was close to getting it. Everything he had to go through to get to it and he finally got it, I’m really happy for him. It’s really awesome. “It [ranks] up there just because it’s your teammate and it’s a really special moment and something that nobody else has ever done. That’s what makes it even more special and I’m just really happy to be a part of it. But none of it would have been possible had it not been for an impressive seven-inning performance by lefty starter Chris Narveson. His brilliance on the mound was lost in the shuffle, but everything was set up by one of Narveson’s best starts of the 2010 season. MILWAUKEE — Judging by their reaction after the final out in Tuesday night’s 4-2 victory over the Cardinals, you might think the Brewers had just won the World Series. While that may not have been the case, what they experienced certainly ranks up there pretty close. As shortstop Craig Counsell fired to Prince Fielder at first, all-time saves leader Trevor Hoffman recorded career save No. 600. “To have that final out hit to Milwaukee’s own, sure-handed Craig Counsell, that was rather fitting,” said Hoffman. 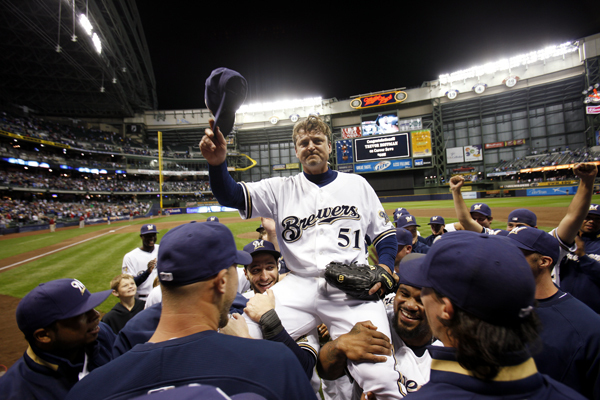 As Fielder caught the feed from Counsell, the Brewers mobbed Hoffman on the mound. For rookie John Axford, the moment presented a fitting role reversal. When Axford entered with one out in the eighth, he appeared to be in line for the five-out save and his 21st of the season. Instead, the historic moment finally arrived for Hoffman. After the emotional on-field ceremony that ensued, Axford was reminded by teammate Zach Braddock of an interesting relationship between Hoffman’s save No. 600 and the first of the 2010 season for Axford. On May 23 at Target Field, after Hoffman had surrendered the closer’s duties, he delivered a scoreless eighth for a hold with the Brewers leading, 4-2, over the Twins. Three months later, it was Axford who delivered the hold in front of Hoffman. Not only was it likely the most memorable hold of Axford’s career, it was also the most exciting win to date for Brewers starter Chris Narveson. When Hoffman began to warm in the bullpen during the bottom of the eighth, fans and players alike began to take notice. In the dugout, teammates were asking Axford if it would be him or Hoffman in the ninth. As the Miller Park speakers began to play “Hells Bells,” their questions were answered. With that, they became spectators along with everyone else in attendance. For the players on the field, however, the moment was more nerve wracking than anything before Counsell and Fielder recorded the final out. Once save No. 600 was in the books, celebration ensued. From all directions — the outfield, infield, dugout and bullpen — Brewers players and coaches sprinted to the mound. First among them was rookie catcher Jonathan Lucroy, who embraced Hoffman after playing an integral role in the historic moment. “It’s something that I’ll remember for the rest of my life and cherish,” Lucroy said. “I got goosebumps standing on the mound waiting for him to get in there. Jordan Schelling is an associate reporter for MLB.com. This story was not subject to the approval of Major League Baseball or its clubs. MILWAUKEE — With his third-inning home run on Monday, Chris Young did more than just tie the game at two runs apiece. The D-backs center fielder became the first player in the Majors this season with 20 home runs and 20 stolen bases. Young, who ranks fifth in the National League with 22 stolen bases, reached the 20-homer, 20-stolen base mark for the second time in his career and the first time since his 2007 rookie season. Including Tuesday’s game in Milwaukee, the D-backs have 49 games remaining as Young chases his first career 30-homer, 30-stolen base season. D-backs manager Kirk Gibson sees it as a possibility for Young, but is more concerned with Young having improved dramatically at the plate, especially as his current .268 batting average is 26 points higher than his career average. “His approach at the plate’s really good,” Gibson said. “He’s really beginning to understand how to get to certain pitches that they used to get him out on. After an impressive rookie season that saw Young belt 32 home runs and steal 27 bases, his production declined in each of the past two seasons. Young had 22 home runs with 85 RBIs and 14 stolen bases in 2008 before dropping to 15 homers and 11 steals last season with just a .212 batting average. Young’s 20th homer came a year removed from his demotion to the Minors last season, where he played from August 10-28 before returning to the big league club. Before he was sent down, Young hit just seven home runs with 28 RBIs and a sub-Mendoza line .194 average. Over the final month of the season, Young’s production picked up, as he tallied eight home runs with 14 RBIs and a .263 batting average. MILWAUKEE — When he stepped in against Trevor Hoffman in the 10th inning on Monday, shortstop Stephen Drew had already reached one career milestone on the day. With his two-run single, he added another. Drew, playing in his fourth full season with the D-backs, collected his 250th and 251st career RBIs. It also happened to be Drew’s 600th career game. Joining Luis Gonzalez, Steve Finley, Chad Tracy and Jay Bell in an exclusive club, Drew became just the fifth player in Arizona history to play in 600 games and collect 250 RBIs as a D-back. “Is that good or not?” Drew asked before learning how many players in franchise history had done so. “To reach that milestone, it’s pretty neat to hear that I was only the fifth one to ever do it. With 250 RBIs, Drew is just the eighth player in franchise history to reach that mark, joining current teammates Mark Reynolds and Chris Young. Drew is only the seventh player in franchise history to play in 600 games and the only current player to have done so. He was not the only one at Miller Park this week who had reached that feat, however, as former D-backs shortstop and current Brewers infielder Craig Counsell played 664 games with Arizona. Despite being just 27 years old, the 600-game mark makes Drew one of the more veteran guys in the D-backs’ clubhouse. “When I first got called up, it was a bunch of veteran guys. We were still in purple then,” Drew said. “We had guys like Counsell and the reason I got called up was he had a broken rib. Gonzo was there still, [Brandon Webb] was still there. To play so many games here it’s nice, especially to stay in one spot, it’s huge. MILWAUKEE — As a 90-mph fastball from Chris Narveson sailed behind the back of Rusty Ryal in the fourth inning Monday night, D-backs manager Kirk Gibson wasn’t surprised, nor was he too upset. With his starter having hit three Brewers hitters, it was just part of the game. “He tried to hit Ryal before that, and then they threw a changeup and [Brewers manager Ken] Macha was over there going, ‘Come on! '” Gibson said. “I understand, I had no problem with any of it. We hit three of their guys — not on purpose — they tried to hit Rusty. While he’s fine with the idea of settling such matters that way, Gibson went on to say he would never instruct one of his pitchers to intentionally hit an opposing batter. Still, he wouldn’t oppose such actions from his pitching staff. “I told Joe Saunders not to hit him,” Gibson said, referring to the D-backs’ game on August 3, when Mark Reynolds was hit in the head by a Nationals pitcher. “But somewhere along the line, if somebody would’ve responded to that throughout that series, to me, that’s one of the things that helps connect you. MILWAUKEE — It’s like someone flipped a switch in the fourth inning. Through the third, right-hander Ian Kennedy appeared headed for disaster. Something changed in his final three frames of work, though, as Kennedy shut down the Brewers and kept the D-backs within striking distance. As it turns out, the difference may have been the weather. Kennedy’s turnaround proved crucial in the late innings as the D-backs turned the tables on the Brewers for a 7-4 win in 10 innings on Monday night at Miller Park. With two wild pitches on the night, Kennedy increased his season total to 13, moving him into a tie for first place in the National League. He also hit three batters, giving him nine on the season and putting him third in the NL. Overcoming the conditions and the rough start, Kennedy helped the D-backs win for just the 16th time this season in 53 games away from Chase Field. Kennedy also surrendered four runs on five hits and three walks. Kennedy did all of this through the first three innings of the D-backs’ series opener with the Brewers. In the fourth, fifth and sixth, Kennedy was unhittable, as he did not allow a baserunner while retiring the final 10 batters he faced. Though he admitted the humidity was an issue, Kennedy credited an adjustment he made for his mid-start turnaround. After Kennedy got them through six, Gibson admitted he was hoping his team “wouldn’t self-destruct at that point.” It didn’t. In fact, it got better as the game progressed. Arizona’s bullpen followed suit in the seventh, eighth, and ninth, allowing just one baserunner on a walk, while striking out five of nine hitters. All told, D-backs pitchers held the Brewers without a hit over 20 straight at-bats before Prince Fielder’s one-out single in the 10th. In the ninth, it was Brewers closer John Axford who was wild. Axford walked the first two D-backs to bat in the inning, before a sacrifice bunt and an RBI groundout to short tied it at 4. All-time saves leader Trevor Hoffman got in on the act in the 10th, surrendering a bases-loaded single to Stephen Drew, which was set up by a pair of walks, for the loss. Pinch-hitter Ryan Church followed with an RBI single to right for the game’s final run. Hoffman (2-5) took the loss while Sam Demel (1-0) picked up his first Major League win. With the way the game had started for Kennedy and the D-backs, they were happy to deny the win for Narveson and the Brewers. Winning for the fourth time in their past five games, the D-backs bounced back well from a not-so-impressive 10-1 loss to the Padres on Sunday. In the four wins, Arizona has averaged 5.75 runs per game while giving up 3.5 runs per game. “We battled and battled,” Drew said. “Ian, I went up to him and he just didn’t have it, and with the sweat and everything else, trying to find a grip. He finally settled in and we got some timely hits and the walk situations were good for us too. MILWAUKEE — With the way Trevor Hoffman has been pitching lately, the possibility of the all-time saves leader closing for the Brewers again still exists, manager Ken Macha said Tuesday. Hoffman’s most recent outing entering Tuesday, a scoreless eighth inning during a 1-1 ballgame on Sunday in Colorado, earned him the decision in the Brewers’ eventual 6-1 victory. It was Hoffman’s fifth consecutive scoreless appearance. Since he gave up three runs and took the loss on June 1 against the Marlins, Hoffman has allowed only three hits. Macha was quick to point out that the decision was not an easy one to make, especially considering the criticism that would come along with replacing current closer John Axford, who began the series against the Twins a perfect 4-for-4 in save opportunities. At the same time, however, Macha recognizes what it would mean for Hoffman to get the four saves he needs to reach the 600-save mark. “I certainly would like Trevor to reach his goal,” Macha said. “If that’s getting 600, I’d like to get that done for him, or 610, or whatever he wants. MILWAUKEE — After he was unavailable to play over the weekend due to a shoulder injury, veteran Jim Edmonds was back in center field on Tuesday for the Brewers. According to manager Ken Macha, the shoulder was fine. Edmonds, who will turn 40 on Sunday, got the start against Minnesota over former Twins center fielder Carlos Gomez, who was acquired by the Brewers during the offseason in a trade that sent shortstop J.J. Hardy west. Since returning from the disabled list on May 21 at Target Field for the Brewers’ first Interleague series, Gomez has struggled at the plate. After collecting five hits in Minneapolis, including a 2-for-4 night with a three-run homer in his first game back, Gomez is 12-for-80 (.150) since May 23. Over the same stretch, Gomez has picked up five RBIs, stolen two bases and walked four times, while tallying 12 strikeouts. MILWAUKEE — With his team off until Friday, first baseman Hunter Morris, the Brewers’ fourth-round pick in the 2010 First-Year Player Draft, joined the club on Tuesday at Miller Park. Morris, a 6-foot-2, 200-pound first baseman from Auburn University, has been busy since leaving home for Wisconsin early last week. He was assigned to the Class A Wisconsin Timber Rattlers, located in Appleton. For Morris, who worked out at Miller Park as a high school senior, as well, the week has been filled with many unfamiliar places. Morris, selected 129th overall by the Brewers earlier this month, was among the first Draft picks to sign with the club. He said that he had no interest in prolonging the signing process. MILWAUKEE — It’s no surprise to see the Brewers among the top three in the National League in nearly every offensive category — not with Ryan Braun, Prince Fielder and NL RBI leader Casey McGehee in the lineup. But it’s the resurgence of another big bat that has the Brewers on a three-game winning streak, with four wins in their past six games and a 6-4 record over their past 10. Corey Hart, who on Saturday became the first Brewers hitter since 2003 to homer in three consecutive at-bats, has given his team a fourth power hitter in the middle of the lineup. Hart’s popularity among fans has soared over the past week after taking a couple of big hits in the offseason. Fans were not happy with Hart after he won his arbitration case despite a down year in 2009. Then, with a poor Spring Training performance coming shortly thereafter, Hart was far from popular in Milwaukee. But keeping his past performances in mind, including an All-Star appearance in 2008, Hart’s coaches and teammates never doubted him. MILWAUKEE — As the Brewers continue to excel on the field, manager Ken Macha continues to tweak the club’s lineup. After batting George Kottaras second on Saturday because of the catcher’s high on-base percentage, Macha made another move on Sunday to get more guys on base. Macha moved his entire batting order up one spot after Rickie Weeks with the exception of shortstop Alcides Escobar, who was in the ninth spot, behind pitcher Randy Wolf. As a result, left fielder Ryan Braun became the ninth Brewers hitter this season to bat second. It’s just the third time Braun has hit second and the first since he was a rookie. Behind Braun, Prince Fielder batted third for the third time this season, Casey McGehee became the team’s third cleanup hitter this season and Corey Hart batted fifth for the second time this year. McGehee is the first Brewers hitter other than Braun or Fielder to bat cleanup since Hart did so on July 1, 2008. The Brewers won that game, 8-6, in Arizona. Wolf is the first pitcher this season to be in the lineup anywhere other than in the No. 9 spot. The only time a position player batted ninth was during the three-game Interleague series with the Twins at Target Field. With Escobar batting ninth, Macha and McGehee were quick to point out, the lineup looks a bit different after the first time through. In fact, it looks a lot more like the team’s usual lineup. As with the Kottaras move on Saturday, the thought process behind Macha’s decision came down to on-base percentage. Fielder (.402) and Braun (.393) rank fifth and ninth, respectively, in the National League in on-base percentage. MILWAUKEE — With John Axford getting the call in the ninth inning of the Brewers’ 8-6 victory on Saturday, many assumed it meant he is the team’s closer. Not so fast, manager Ken Macha said in his postgame news conference. Axford, a flame-throwing 27-year-old right-hander, is 2-for-2 in save opportunities this season. Add those to his save at the end of the 2009 season, and he is a perfect 3-for-3 in his short big league career as a closer. Though his career total is still 593 behind that of Hoffman, Axford doesn’t let the pressure of the situation get to him. Though Macha has been impressed by Axford’s recent performance out of the bullpen, he sees greater value in having several pitchers who are comfortable with pressure situations in the late innings. “There’s no problem having a couple,” Macha said. “My last year in Oakland, we had six guys with saves. I’d like to get Trevor back. … The more guys you can bring in pressure situations and they’re able to get outs, that makes your bullpen that much stronger. When asked about his bullpen in his morning session with the media, Macha said that he hoped to get Hoffman in the game on Sunday. He did not, however, specify an inning in which that might happen. With 12 home runs, Corey Hart is tied with three others for the most in the National League. … The Brewers’ pitching staff gave up its first home run in nine games on Saturday after tying a 34-year-old franchise record. … Entering Sunday’s series finale with the Mets, no Brewers starter had allowed a home run in 13 consecutive games, a franchise record. The longest previous streak was 12 games, from May 7-21, 1976. … With nine home runs and 19 RBIs since May 15, Hart leads the NL in both categories over that stretch. … The Brewers’ three-game home winning streak is a season high. … David Riske, who is on the 60-day disabled list, picked up his second win for Triple-A Nashville on Saturday night, giving up two unearned runs with one strikeout in two innings pitched. Lefty Mitch Stetter also threw one shutout inning in relief, with two strikeouts. MINNEAPOLIS — With the way things had been going, the Brewers needed a complete team effort from their pitching staff on Sunday against the Twins. That’s exactly what they got as five pitchers combined to lead the Brewers to a 4-3 win in the series finale at Target Field. Before the series finale, manager Ken Macha worried that short pitching performances could leave his staff in a state of “total disarray.” That’s because after a one-third-of-an-inning outing by Dave Bush to open the series and a 12-inning game on Saturday, the Brewers had no starter available after using lefty Manny Parra in the 11th and 12th innings in the second game of the series. Instead, the Brewers avoided that scenario and put together the best complete-team performance they’ve had since before losing 11 of their last 12 games. With the Brewers down a run in the fourth, right fielder Corey Hart stayed hot, crushing a 1-0 pitch from Carl Pavano to the third deck in left, the first ball that has been hit there in Target Field. At an estimated 440 feet, Hart’s home run was the longest yet at the new stadium. Hart’s blast was his ninth of the season and sixth in the last nine games. First baseman Prince Fielder added a solo shot to right in the sixth, which proved to be the eventual game-winning run. But it was the Brewers’ pitching that stole the spotlight on Sunday. Marco Estrada, who had thrown 21 pitches in relief less than 24 hours earlier, got the nod for the start and gave the Brewers three innings, in which he allowed two runs on four hits. After Estrada was Parra, who remained available to pitch despite being unavailable to start. After being tagged with the loss the night before, Parra (1-3) got the win, throwing two scoreless innings while giving up three hits, walking two and striking out a pair. With that, the Brewers led, 3-2, through five innings, despite having used two pitchers that had thrown in relief the previous night. But as impressive as the Brewers’ first two pitchers were, it’s the late innings that have been the biggest problem recently. Fortunately for them, the last three pitchers got the job done as well. Lefty Zach Braddock, who was called up from Triple-A Nashville before the game, delivered two impressive innings, giving up just one hit and one walk while striking out a pair. With the way Estrada and Parra started things off, Braddock said he didn’t want to disappoint. Next up for the Brewers was veteran reliever Trevor Hoffman, making his 1,000th career appearance. In his first action since stepping out of the closer’s role to work with Peterson on his mechanics, Hoffman was dominant in the eighth. He needed just 10 pitches, nine of which were strikes, to retire the Twins in order and set things up for John Axford to close it out in the ninth. Axford, who got his first Major League save on the final day of the 2009 season, was sent out with a chance for his second in the ninth. In order to do so, however, he had to get through the heart of the Twins’ order. After a leadoff double by Orlando Hudson to the gap in right, Axford got Justin Morneau and Michael Cuddyer each to strike out swinging with 96-mph fastballs. Axford still wasn’t done, though, as Jason Kubel singled in Hudson and the Twins loaded the bases two batters later. But with a 1-2 curveball to Plouffe, Axford secured the win as they avoided what would have been the club’s fourth sweep in their last five series.